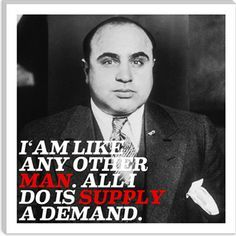 Al Capone was taking in about $105,000,000 a year in revenues in the 1920's, or about 1.4 billion in today's dollars. At 21 years old, he was an unknown bartender and bouncer. But by the age of 28, he was one of the richest and most powerful gangsters in the world. From these days, his name will forever synonymous with the word gangster. 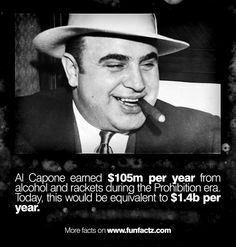 It is estimated that by 1929, Al Capone's income from the various aspects of his business was $60,000,000 (illegal alcohol), $25,000,000 (gambling establishments), $10,000,000 (vice) and $10,000,000 from various other rackets. It is claimed that Capone was employing over 600 gangsters to protect this business from rival gangs. 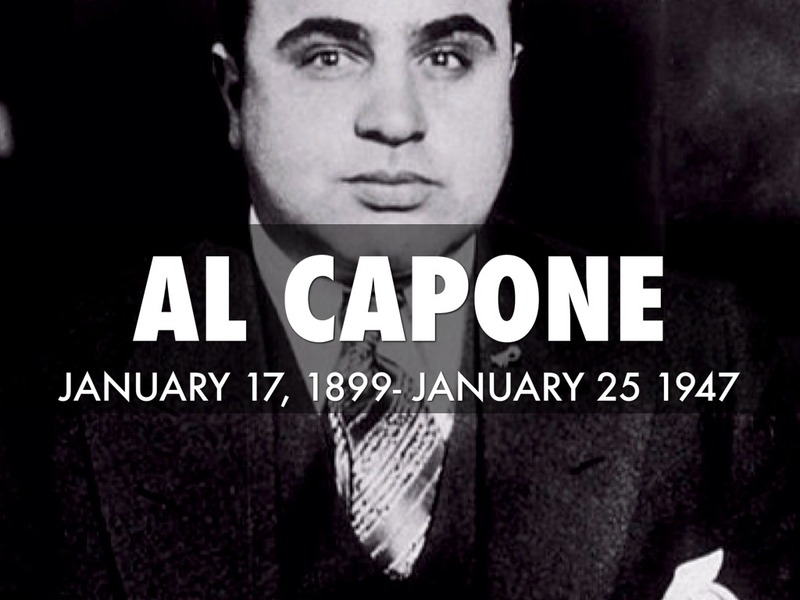 Al Capone might not have been your typical entrepreneur. After all, he was convicted of tax evasion and was actively involved in prostitution, bribery, smuggling and selling illegal booze. But just because his business wasn't legal doesn't mean Capone didn't know a thing or two about running a successful operation. 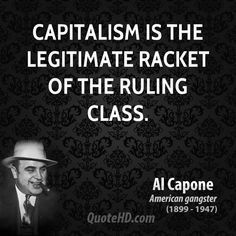 In fact, Capone owned more than 300 businesses and knew how to get things done and command respect and loyalty from his employees. In fact, Capone's business acumen may well have been one of his greatest assets, according to Deirdre Marie Capone, Al Capone's grandniece who lived in the house of her famous (and favorite) uncle. Capone, the last member of the family born with the Capone name, authored an explicit memoir that details her efforts to hide the fact that she was related to Capone and recounts her decision to eventually embrace her name and family history. The book, "Uncle Al Capone…The Untold Story From Inside His Family" (Recap Publishing, 2011), tells many never-before-known facts about this iconic figure's life, death and business dealings. In the book, she recalls what life was like as a child growing up in the Capone household and shares fond memories of the man who taught her to ride a bike, swim and play the mandolin. Capone said she knows what the "family" was really like, and what the "outfit" was all about. In her tell-all book, she shares details untold until now, including her claims that that Ralph (Al's older brother) and Al Capone lobbied the Nevada legislature to legalize gambling, alcohol and prostitution in that state; that they were the owners of the first upscale casino in Las Vegas way before Bugsy Siegel came to Vegas, and what really happened in the St. Valentine's Day Massacre. In an exclusive interview with BusinessNewsDaily, Capone gives us some business tips that could have come directly from her notorious uncle. You're only as good as your word. Al Capone ran a very efficient business, she said. He taught every person who worked for him: "Your word should be your bond." Remember where you came from.When Al Capone saw one of his employees strut around acting like a big shot, he would tell him: "Don't let your head get too big for your hat." Be honest with your business partners. Ralph and Al Capone needed to give orders just once to the employees and they were expected to do their jobs correctly. Al Capone would instruct them, "Don't lie to the people you work for." Remember, it's never easy. Al Capone at one time ran more than 300 different establishments. 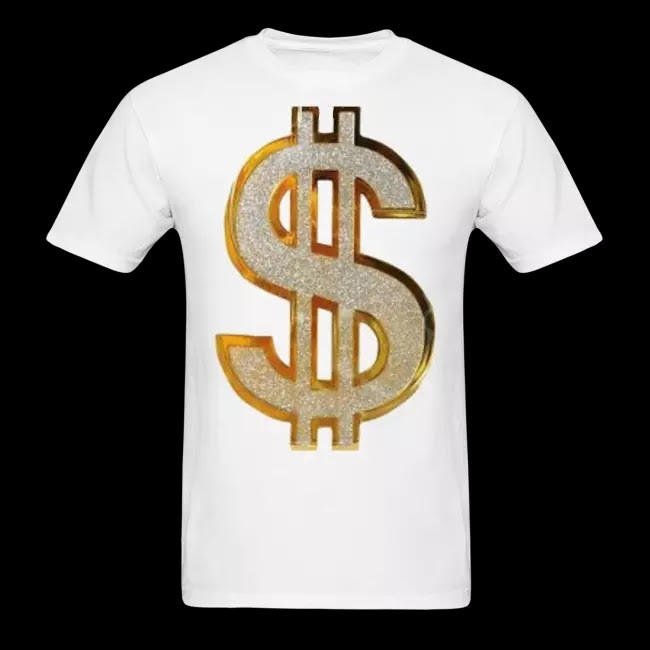 When a reporter wrote about how easy it was for him to make money, he was quoted as saying. 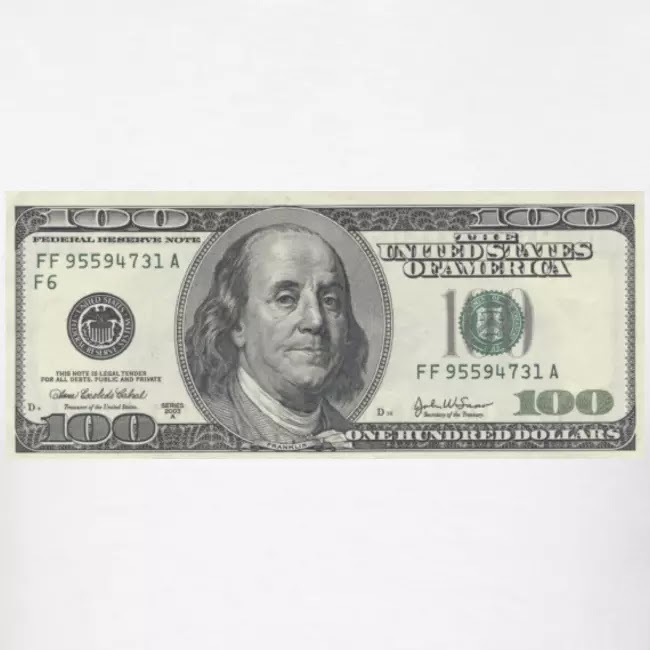 "Find out what it's like to run a business and meet a payroll." Earn your customers' loyalty. Al Capone supplied good quality alcohol to the citizens in Chicago from 1920 to 1931 during Prohibition. He was quoted by a reporter as saying "Be loyal to friends and invincible to enemies." In The Untouchables, Capone says: “You can get more with a kind word and a gun than you can with just a kind word alone.” This statement is the foundation of Capone’s kingdom. He ran Chicago and he took over the bootlegging racket because he was feared. I’m not saying violence is the answer, but what I am saying is that a Mafioso is feared. In the movie, Capone blows up a bar that wouldn’t buy his beer. What do you think the next bar owner is going to do? He’s going to buy Capone’s beer because he fears him. You don’t need to blow anything up, but people gotta understand that you mean business. Another trademark of Alphonse Capone that was shown in The Untouchables was his success in bribing city officials. He knew where and when Eliot Ness was going to organize a raid because half the city’s police force was on his payroll. His men had permits to carry concealed weapons signed by the mayor. Why? Because the mayor was on his payroll. When he goes to court, the jury is paid off and the judge is paid off. Capone made sure that the city officials ran the city the way he wanted them to. He knew that whatever money was spent in bribing officials was a good investment. He was a master at bribing people, and Capone showed that bribery can go a long way. After his first alcohol raid failed miserably, Eliot Ness realized he had the wrong people. His answer came from the Irish beat cop Malone (Sean Connery) who said: “If you don’t want rotten apples, don’t get them from the barrel — get them from the tree.” Ness couldn’t work with the Chicago police force because most of the force, including the chief of police, were being paid off by Capone. Instead, Ness and Capone go to the Police Academy to recruit "greenies" who hadn’t been corrupted yet. His crew was small, but Ness had the right people on board. Capone was good about keeping himself out of trouble; he covered his tracks well, but he didn’t cover all of his tracks. He hadn’t paid an income tax in years. In fact, Capone showed no income at all on his tax documents. It was this discovery that eventually brought him down on income tax evasion charges. Had he only showed a small income, had he but paid a small amount of taxes, the story of Al Capone might have ended much differently. He might have been around much longer and grown his empire much larger. That’s why you gotta cover all your tracks; you could go down because of the smallest thing. You can never be too thorough when covering your tracks. Alphonse Capone’s first big mistake was to publicly show off what he had accomplished. Instead of laying low and enjoying his position at the top of the Chicago food chain, Capone spoke to reporters constantly. He made sure everyone knew just how successful he was. He owned and lived in the Lexington Hotel. Everything he did was eccentric and extravagant. That was all well and good in Chicago, where he had even the Mayor on his payroll, but once the federal government took notice, his demise began. Run your rackets and keep your head low. Don’t make yourself a celebrity and your operation will last a lot longer, capisce?